BSNL Management Trainee Recruitment 2018 | Apply for 300 Vacancies! BSNL Management Trainee Recruitment 2018 | Apply for 300 MT Vacancies! 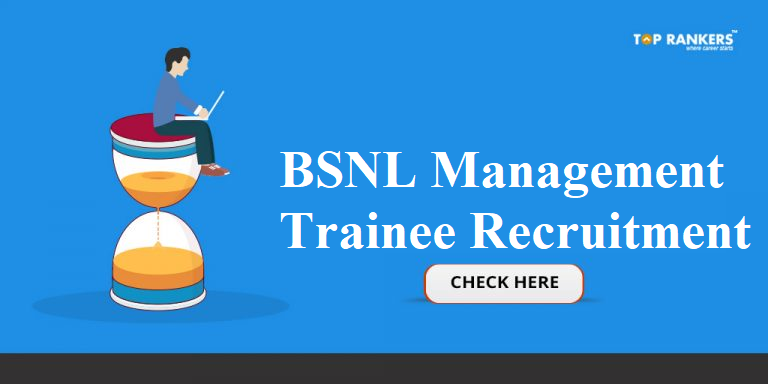 How to Apply for BSNL Management Trainee Recruitment? Check official BSNL Management Trainee Notification along with other important details regarding BSNL Management Trainee Recruitment. Direct link to apply for BSNL Management Trainee Recruitment 2018. Bharat Sanchar Nigam Limited, BSNL has published official notification for 300 Management Trainee Recruitment. The process of online application process has started from 26th December 2018 and the last date to apply online will be 26th January 2018. The online assessment process (examination) is scheduled to be conducted on 17th March 2018 for all the eligible candidates. Eligible candidates can apply through the direct link provided in this post. The direct link to apply has been updated. Read more about the application process and start applying. There is a total of 300 vacancies for the post of Management Trainee is notified through the notification. Out of 300, 150 will be recruited from the open market (External candidates). Visit the official website of BSNL. Look for Recent Notice and click on it. Find the relevant recruitment and click on it. Now look for apply now and start your application. Upload all the documents required as mentioned in the official notification. Take a print out of the final application for future reference. All the applicants need to possess a Bachelor of Engineering/ Bachelor of Technology degree or equivalent engineering degree in Telecommunications, Electronics, Computer/IT & Electrical with minimum 60% marks (55% for SC/ST candidates) from a govt. recognized university or equivalent. Hoe you liked our post on BSNL Management Trainee Recruitment 2018. If you have any Query or suggestions, Do write us in the comments below. IBPS PO Score Card for Mains out Now | Download your Score Cards Here!